Have you ever had one of those surreal moments when someone you idolized as a child or a dream you had as a child that seemed so silly and out of reach came true? Even years later? That moment came real for me recently and I can’t want to share with you about it. 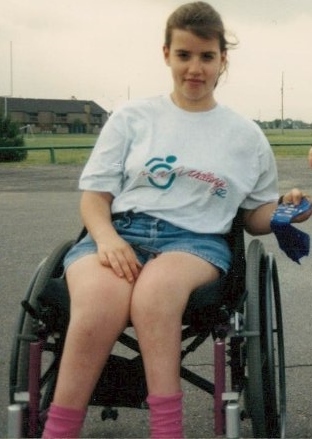 This was a few years later but it’s the only digital picture I have of me at the wheelchair track races. I was practicing for those races when I first met Sasha back in the late 1980s. From what I can see, this picture is from 1992. In a blog last month, I shared about my family’s love for the Wichita State Shockers. I shared rather unabashedly about a crush I had as a nine-year-old on a Shocker player who was there in the late 1980s named Sasha Radunovich. Sasha hailed from the now former Yugoslavia and I thought he was so, so wonderful. I even got to meet him briefly at a practice for my wheelchair track meet. He was nice and incredibly pleasant and I’m happy to say that 25 years later, that hasn’t changed! Now, how could I possibly know that? Well, I got an email a while back that shocked me. To be perfectly honest, I thought at first it might be my cousins or brothers pranking me about the blog I wrote. I finally realized that this email was in fact from the Sasha Radunovich and he was writing from all the way across the world. He keeps up with the Shockers and through that found my blog. He was very kind and wrote to me about the blog and about his life since then. I wrote back and we had a very pleasant exchange. I couldn’t wait to tell my family about it and they were as shocked as I was. They told friends and everyone encouraged me to ask Sasha if he would be willing to be interviewed for my blog. See, he was pretty popular back then and a lot of Wichita folks remember him and have wondered where he went after graduation. He is known for great ball playing and just being an all-around nice guy. It was thrilling when Sasha agreed to the interview and to submit a current picture. I was pleasantly surprised that I recognized him from the photo (who else did I think it would look like?!?). My career plan to be a journalist began at a very early age and always thought it would be cool to interview Sasha. Sasha in 1988. I found this photo online from a now expired ad. When were you at Wichita State University? I went to WSU from 1985 to 1989. What was your degree? I got a degree in Liberal Arts and Sciences. Actually, I wanted to get a degree in Sports Management but since I lost my first semester at Wichita learning English, Liberal Arts was the only degree I could complete in 3 ½ years of scholarship that I had left. How did you get recruited to Wichita State? 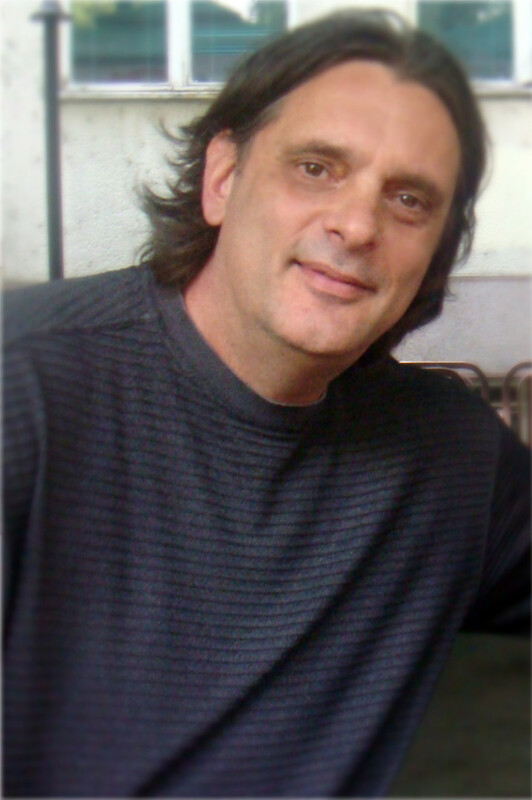 In 1984, I played on the same team in ex-Yugoslavia with an alumnus of WSU, Zarko Djurisic. Zarko made a phone call to then coach Gene Smithson and told him that I would be interested in studying and playing basketball for WSU. Of course, Coach Smithson didn’t waste his time and came to Belgrade to watch me play. We couldn’t find a gym in Belgrade to hold a practice so we went to a store, bought a basketball, and found a playground. Coach Smithson told me to shoot a ball and I remember I shot only once and he started yelling, “You’ve got a scholarship!” That’s true. That’s how it happened. To tell you the truth, I never heard of anyone getting a scholarship like that but obviously Coach Smithson knew his basketball. What are your fondest memories of your time at WSU? Well, my best memories are tied to two great families – the Fromms and the Streets. These two families received me and took care of me like I was their own child and it is only now, from my current perspective as a parent, that I can truly appreciate all they did for me. Also at the time, and I’m not aware if it’s still the case, WSU had a great intensive English learning program where I had the chance to meet people from all over the world and I made some great friendships. After I graduated I played basketball for 11 more years but I never met people nor experienced the same atmosphere around the game as I had at Wichita State. What did you do after leaving WSU? Even though I had invitations from five NBA teams for tryouts, I decided that Europe was the place for me to continue playing because I wasn’t sure that even if I made it to some NBA team, I would have opportunities to play. A year after I left WSU, I married Barbara, my college sweetheart and today we have a 21-year-old son, Aleksa, and a 17-year-old daughter, Eila. Sasha Radunovich now. He’s an entrepreneur, a husband and a dad. And still a nice guy. What do you do now and in general where do you live? After retiring, we all moved back to the capital of Montenegro, Titograd, now called Podgorica. Since retiring, I’m an entrepreneur and dedicate myself to investments in real estate and construction projects. What I enjoy the most is a basketball school that I founded five years ago of which I am the owner and president. My partners and I constructed our own facility with three basketball courts, adjoining locker rooms, weight room, dormitory and a restaurant. In this school, at any given moment, we have at least 300 kids ages 10 to 18 practicing and perfecting their skills. I’m really excited about my school and to tell you the truth, I enjoy basketball even more now, in this capacity, than I did as a player. What advice or thoughts do you have for this generation of Shockers? Well, I think the advice I can give to any Shocker player now is that which they have heard many times before: get your education, that’s the most important thing. Basketball ends very quickly and you’ll still have most of your life ahead of you. Is there anything you would like the people of Wichita to know? I never forgot Wichita and WSU and all the nice people that gave me their hearts and friendship during my four wonderful years there. I never stopped following the Shockers and I still get excited like a little boy with their every win. I hope I’ll have a chance to visit Wichita very soon with my family. From Jamie: Thank you, kind sir, for being a good role model for a little girl back then and for letting me share your story with friends, family and Shocker fans all over the world! Can you get me in touch with Sasha, my family (Fromm’s) were very close during his 4 years at WSU. He was actually in my wedding, and I would like to reconnect with our long lost friend. Wow, Jamie! This is fabulous. I’ll bet you can hardly contain your excitement! Way to go! I’m extremely late but just found this post. 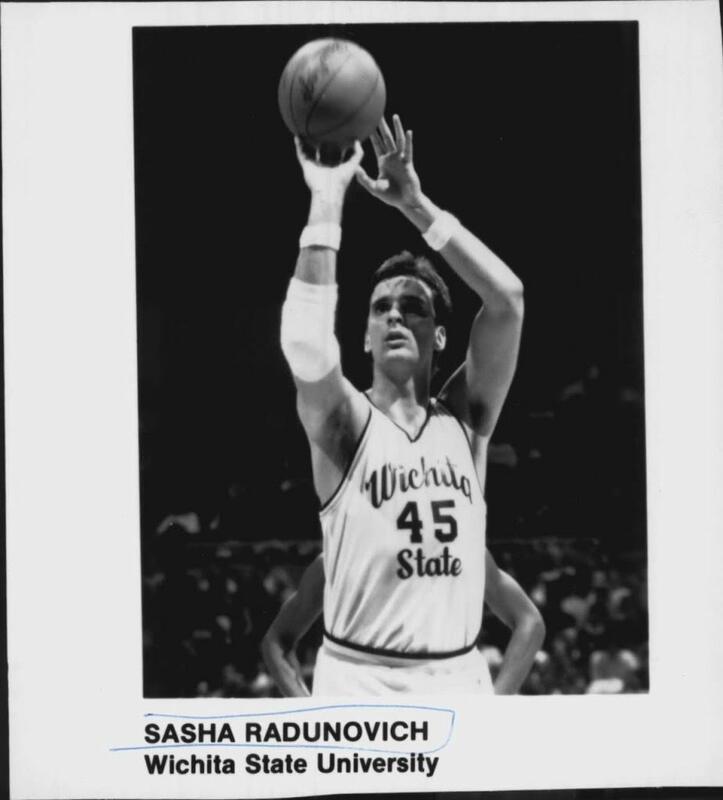 I was also a young girl in Sasha’s era with the Shockers and had an adolescent crush on him too. I remember doing a 5th or 6th grade project on Yugoslavia and calling Sasha for an interview back then. He was a perfect gentleman and kindly answered my questions. It makes me happy to know that he founded a youth basketball program after he left Wichita State and returned to his homeland. I always wondered what happened to him. Thanks for this post!